A lot of myths regarding Indian railway but we are not talking about myths but true interesting facts about Indian railway. Read and scroll with patience hope you will get something new. The first train launched in Indian subcontinent at 1853, it was a long ago and it was the period of British ruled India. Indian railway network is worlds fourth largest railway network. Its length is one hundred and fifteen thousand kilometers but the active length is sixty-seven thousand three hundred and twelve kilometers. You know worlds largest railway network is on behave of USA and its length is two and half hundred thousand kilometers. After USA China has the largest railway network. Its length is around One hundred thousand kilometers and then Russia has ninety thousand kilometers length long railway network. According to a statistics in 2014, there are almost fifteen hundred thousand people work in Indian railway. And this is the worlds seventh employment agency in the world. Can you please imagine Fifteen hundred thousand people? how big the network is? Really interesting fact about Indian railway. Indian railway longest rail route is Diborgorh to Kaniakumari railway route. The length of this route is 4286 kilometers and it takes 82 hours around to travel this route and need to cross Fifty-six stations. How horrible the train journey is? A five twenty-eight kilometers journey without any break and the journey is six hours long. Have ever heard such types of the journey? Yes, this is the longest journey without any break nonstop journey between Vadedara and Kotar. Besides Hawra and Amitshar express have 115 stoppages on their journey. You know Indian fastest train name? Shotabdi express is the Indian fastest train and its speed is around 150 kilometers per hour runs Naya Delhi to Vupal. Fastest train is not so interesting but the lowest speed train is more interesting fact. Nilgiri express is the lowest speed train in India. Its speed is Not too more than walking speed ten kilometers per hour. Longest name station and shortest name station: The biggest and most notorious station is located in the Arakanam-Ranigund section near Chennai. Its name is Vankatansarsingharajuvaripeta. On the other hand, 'Odd' is the smallest station located near Jharsuguda in Orissa and the delight of Gujarat's delight. Nabapura railway station is serving two states together. Half of it is in Maharashtra and half in Gujarat. Srirampur and Belapur stations in Ahmednagar district of Maharashtra are located in almost the same place. Fare Queen is the train of India's oldest active locomotive train engine. In 1855 the engine was created. It is also the world's oldest active steam engine. The longest platform in the world has Indian Railways. The 1.35-kilometer long platform is named after Gorakhpur (Gorakhpur). The station is located in Uttar Pradesh. In 1986, for the first time, computerized ticket reservation system was introduced in Indian Railways. Indian mobile app launched in 2014. 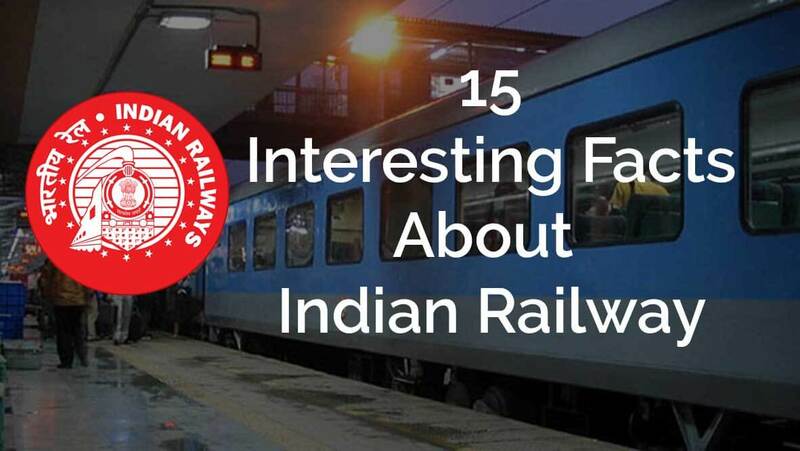 Do you know how many railway stations in India? Seven thousand and five hundred railway stations. The largest railway tunnel of India is Pir Panjele situated in Jammu and Kashmir, India. India has world tallest railway bridge. Its altitude is more than the Eiffel tower, 359 meters tall. These are the fifteen interesting facts about Indian railway.